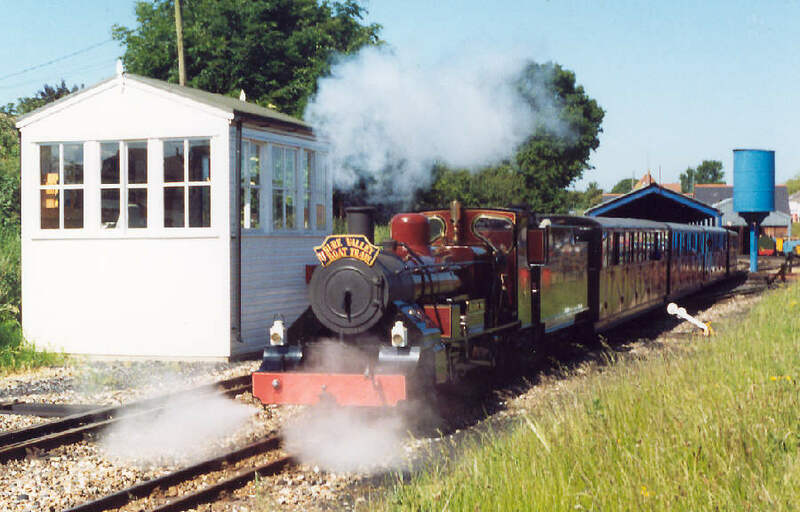 Wroxham to County School branch, and is mainly operated by steam locomotives. with intermediate stations at Brampton, Buxton and Coltishall. and passes through some of the most picturesque countryside in Norfolk. Well here we go again, the cycling season is upon us once more, we've been looking forward for some weeks now to our first cycle ride of 1999. Waiting for a break in the weather or a weekend free of formula 1 Grand Prix racing on the telly (our other obsession). It’s Tuesday the 1st of June, I'm enjoying a couple of days Holiday from work, and the schools are enjoying their half term holiday, James has decided to give this one a miss. So Benjamin, ‘its you and me Kid’ the weather looks great so lets go.Our Planned route today is from Aylsham to Wroxham along the path which runs beside the Bure Valley Railway, as I mentioned in cycle ride two we were discouraged from contemplating a ride along this route because of a sign situated at the beginning of the path at Aylsham clearly stated ‘cycling was not permitted’. 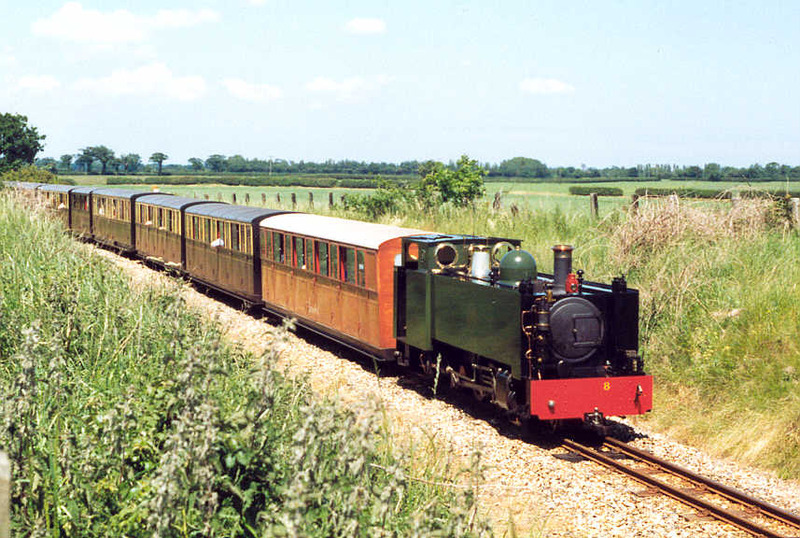 with the 12.45 Norwich - Sheringham service. 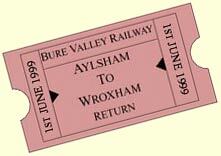 On arrival at Aylsham we parked the car at the Bure Valley Railway car park and decided we would have a look round the station and souvenir shop before preparing to embark on this our fourth cycling adventure. The 10.15 bound for Wroxham was about to leave so after a quick visit to the toilets we returned to the car to untangle and remove our bikes from the back of our VW Golf. Since changing our car we have to remove the front wheels from both our cycles in order to accommodate them in the back of the Golf to get the tail gate shut. (Its times like this when I miss the spacious boot area of the old Saab). Anyway, with our bikes assembled and all essentials aboard we head for the Bure Valley path, the access to the path is in the far corner of the car park near the turntable. The sign saying PEDESTRIANS ONLY, NO CYCLES, MOTORBIKES OR HORSES,is still on display but we've had our assurances from the BVR that its OK to cycle. We pause opposite the small signal cabin to observe and photograph the departure of the 10.15 boat train to Wroxham collecting the token from the signalman as it passes. We set of in pursuit easily keeping pace with the train until it picks up speed. It gave a lengthy blast on its whistle as it descended the 1 in 76 bank to pass through the steel and concrete tunnel under the A140 Aylsham bypass. The original standard gauge line crossed here by means of a level crossing, the East Norfolk Railway’s gate-keeper’s house still remains and is occupied. By the time we had negotiated the traffic on the bypass and the two wooden chicanes at the entry/exit point to the path the 10.15 was well on its way leaving a light trail of smoke as it disappeared into the distance, the early morning sun glistening on the locomotive and its carriages. The path has quite a reasonable surface considering it wasn't constructed for cycling on, though fenced off from the railway its part of the old track-bed and runs parallel along the North of the line as far as Little Hautbois Hall, at which point it crosses to the South of the line through to Wroxham. Before long we passed under the first of the many brick arch and girder bridges along the 9 mile stretch of line, 17 in all, (that's almost 2 to every mile). Next we came to Spratts Green level crossing where again the gate-keeper’s house still remains and is occupied. In the large garden of the property we observed an old Bauxite brown ex-railway goods van, these are often seen dotted around rural area’s, purchased by farmers and smallholders etc. as they became redundant from the railway, a useful ready made shed for storage or keeping livestock. 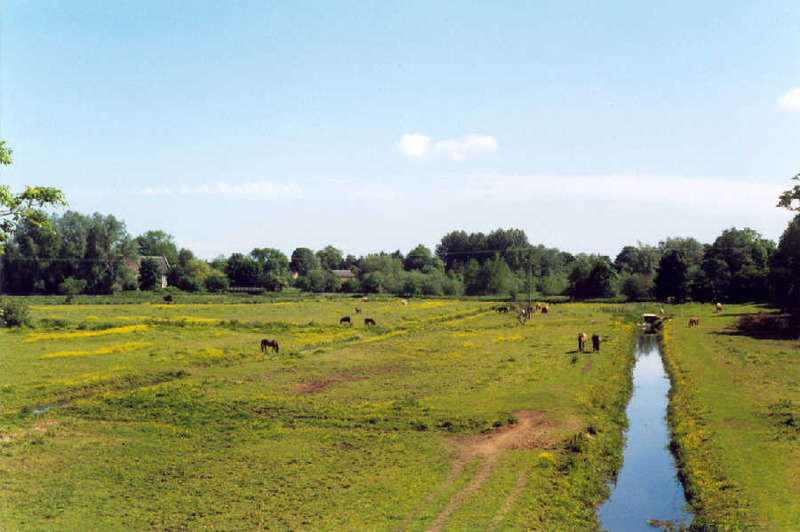 As we continue, the prettiest part of the ride in my opinion can be seen to the north as we look across the valley and water meadows from the embankment to the small villages of Burgh next Aylsham and Brampton where cattle and horses were grazing the pasture. surroundings, Its at Brampton, just beyond the halt that we come across the first passing loop, here we were met a by a little diesel (the 10.15 to Aylsham) still adorned with its face from yesterday’s Thomas the Tank Engine event.We press on and soon arrive at Buxton. 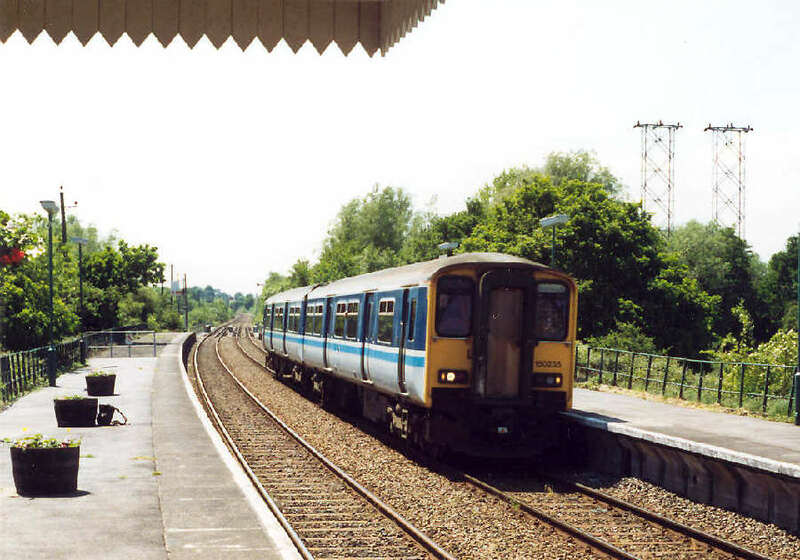 Buxton BVR is built on the site of Buxton Lamas station, like the intermediate stations at Brampton and Coltishall is basically just a halt, there are no buildings or waiting shelters just a low concrete pavement type platform for passengers to light onto and a station name board. The original Buxton Lamas station building remains as a private house. 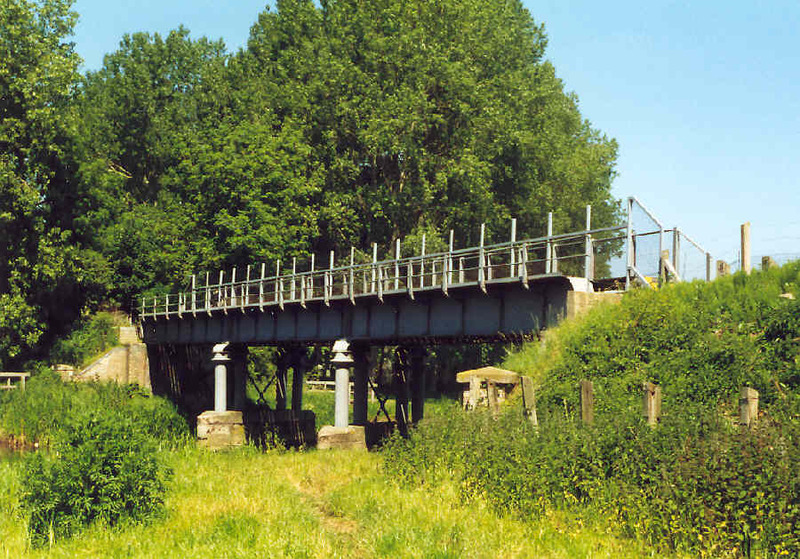 Shortly after leaving Buxton we came across the longest bridge on the line, the 105ft girder bridge which spans the river Bure just down stream from Buxton mill. Incidentally it was at this point we encountered the grumpy gentleman who mumbled ‘NO BIKES’. We replied with a polite ‘GOOD MORNING’. We paused on the bridge for sometime taking in the view and watching the trout in the crystal clear water, I don’t think I've ever seen so many trout all at once. We took a couple of photo’s before moving on. After a few hundred yards we reach the halfway point ‘Hautbois loop’ the principal passing place for the trains, just beyond the loop the path changes to the south of the line via a level crossing at Hautbois Hall. As we cycled on toward our next stop we could clearly see RAF Coltishall on our left, the Railway is only a few hundred yards from the end of the runway, directly under the flight path of aircraft taking off and landing, hence the curve at this point is named ‘Runway curve’, although there was no activity at the base today I would imagine this would be a fine vantage point for aircraft spotter’s (sorry enthusiasts). Two of the loco’s at the BVR have Commemorative names linked to the history of RAF Coltishall, 2-6-2 ZB No.7 Spitfire, and Bo-Bo No.3 2nd Air Division USAAF. The base is home to 6, 41 and 54 Squadrons all equipped with Jaguar fighters. After about a mile we arrive at Coltishall station, basically the description is identical to that of Buxton, Coltishall differs in as much as it has a passing loop and an Island platform, nothing of the original East Norfolk Railway remains today except the station building which is now a private house. As we leave Coltishall for Wroxham now only 2½ miles away we pass under four bridges in very quick succession before arriving at our 3rd level crossing ‘Belaugh Green’, as with all other gate keeper’s houses along the line it is privately occupied and well maintained. We cross the road, again negotiating the wooden chicanes which are almost as numerous as the bridges along the route. After a couple of hundred yards we could see ( to the north ) the Norwich - Cromer line, so we knew Wroxham wasn't far now, we were both looking forward to our picnic lunch. As we approached Wroxham, the BVR runs into a cutting as it curves to the right before running into the Wroxham BVR station parallel with the ‘Anglian Railway’s’ line from Norwich to Cromer and Sheringham. The path continues along the top of the cutting before descending sharply to track level at journey’s end. On finishing our lunch we walked to the north end of the platform to take a picture of the signals and signal box, they are due to disappear in a 12.5 million upgrade of the Bittern Line by its owners Railtrack. 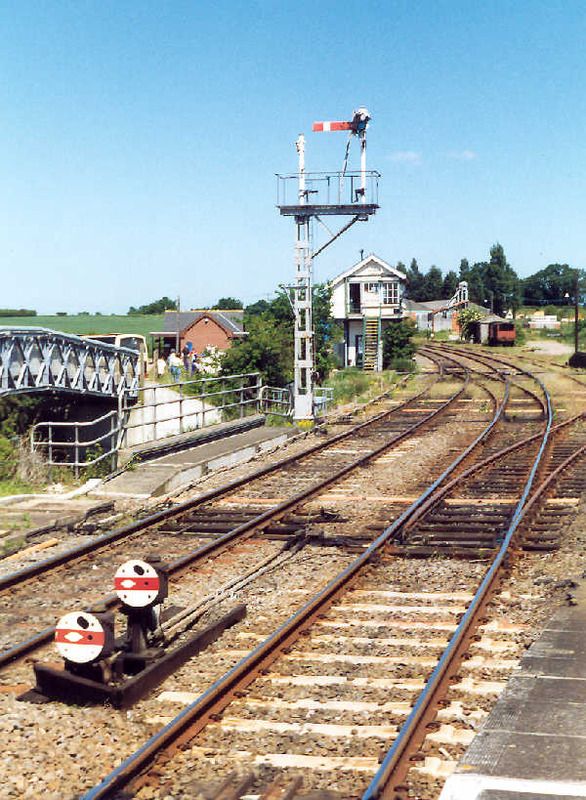 The bracketed semaphore signal which stands at the end of the down platform once supported the starter signal for the old County School branch, the pillar on which it was mounted still remains but the arm itself has long since been removed, we also observed two old brake vans (one BR and one ex LMS) standing in a siding they don't look as if they've been moved for years. 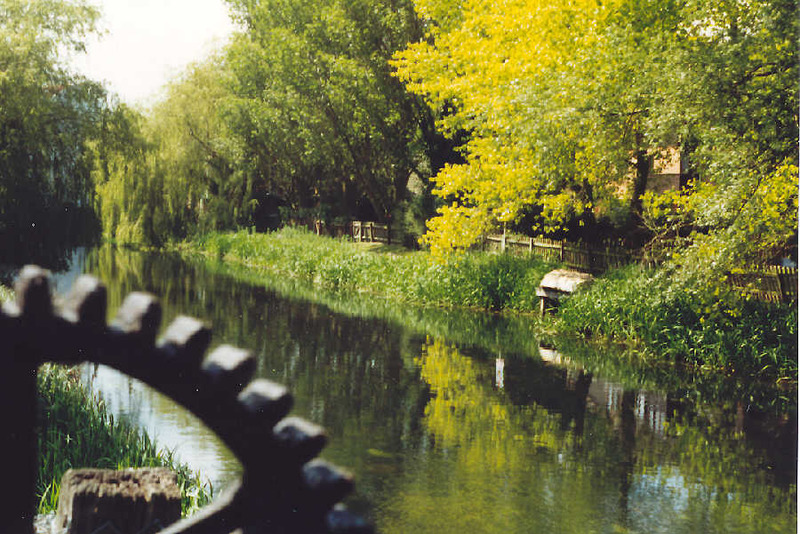 Right, we’ve had an hour’s break its time to move on, we make our way back over the footbridge to the BVR, as we do so we recognise a couple walking toward us as the couple we passed on the path just outside Aylsham earlier, they had obviously walked the whole length of the path. Before setting of on our return we visited the BVR souvenir shop and bought a chocolate bar each to sustain our energy levels, while in there I picked up an interesting leaflet issued by a partnership between Local and district councils, Anglia Railways, the Rural Development Commission, and the North East Norfolk Travelers Association, (NENTA), which promotes cycle routes in the North East of Norfolk using the train service on the Bittern Line as a means transport to access the area, it includes a train timetable, an excellent map and descriptions of the nine cycle rides it promotes .............GOOD IDEA. 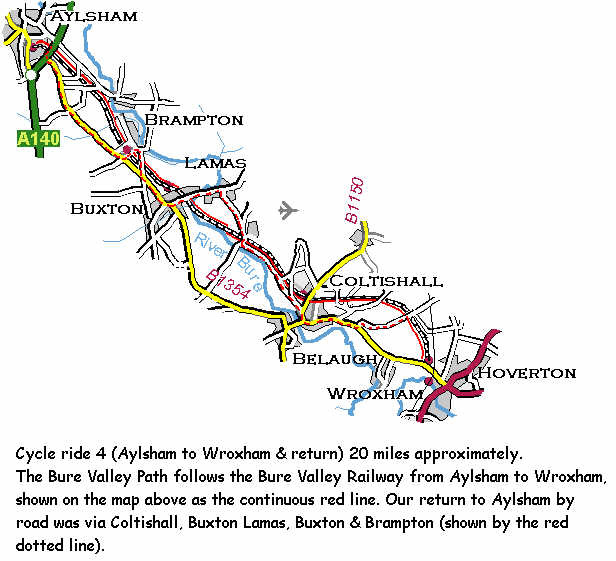 this point we made an error and instead of taking our intended route to Aylsham via Burgh next Aylsham. we found ourselves back on the B1354 amongst the traffic, never mind we pressed on soon arriving at the A140 Aylsham bypass a few yards from the Bure Valley path where we set off from this morning. We entered the path and cycled the short distance back to the BVR car park where we disassembled our bikes and loaded them back into the VW feeling a little relieved and for me a little disappointed that we missed what was probably the pettiest part of our return journey. The time was now 14.45, not bad 4½ hours considering we stopped for 1 hr at Wroxham for lunch. We sat in the car and finished off what was left of our refreshments before walking over to watch the arrival of the 14.00 from Wroxham, I must say that if today’s passenger numbers are any thing to go by the BVR is certainly a very popular tourist attraction.